Imagine!, Vagabond Visual Concepts, Manitowoc, WI November 10, 2017 to January 7, 2018. OPENINGS, Two Fish Gallery, Elkhart Lake, WI. April 20 through June 3, 2018. Alive in the Arts Juried Exhibit , Plymouth Arts Center, May 11 to August 3, 2018. ​Big Ideas, Gallery 224, Port Washington WI, June 8 through July 28 2018. ABOVE & BELOW, Two Fish Gallery, Elkhart Lake, WI. June 22 through August 19, 2018. 20/20, Two Fish Gallery, Elkhart Lake, WI. September 14 through October 28, 2018. Social Culture Café group exhibit at Internazionale a Ferrara, Ferrara, Italy. October 5 to October 7, 2012. Ain't That America (Grand Opening Exhibit), Creative Studios Art Center, Sturgeon Bay, WI August 31 to September 30, 2013. A Holiday Membership Exhibition, Plymouth Arts Center, Plymouth WI, December 6 2013 to January 24 2014. A Holiday Membership Exhibition, Plymouth Arts Center, Plymouth WI, December 5 2014 to January 23 2015. 20th Annual Holiday Membership Exhibition, Plymouth Arts Center, Plymouth WI, December 4, 2015 to January 22 2016. "Painting With Light...Many Ways" (Photography Invitational), Plymouth Arts Center, March 18 - May 13 2016. Grand Opening Art Exhibition, ArtLofts, Manitowoc WI, July 22 to July 25, 2016. 21st Annual Holiday Membership Exhibition, Plymouth Arts Center, Plymouth WI, December 2, 2015 to January 20 2017. Fond du Lac Visual Arts Exhibit, Langdon Divers Gallery, July 5 to August 1 2017. Qualified finalist, World Water Day 2012. One of 121 International iPhoneographers featured on the Hipstamatic Sardinia commemorative poster, September 2012. Two Fish Gallery, Elkhart Lake, WI. Cedar Valley Resort/Retreat, West Bend, WI, iPhoneography November 9, 2013, August 9, 2014, August 22, 2015 and August 6, 2016, July 22, 2017. Member of the jury team for the Artdose Magazine January 2015 Photography Juried Exhibition. Member of the judging team for the 2015 Kohler Co Associate Photo Contest. Studio 224, Part Washington, WI, Pass It Around Workshop, September 9, 2017. THELMA Sadoff Center for the Arts, Fond du Lac WI, Smartphone Photography Workshop, October 21 2017, April 7, 2018. Two photos included in Manitowoc Herald Times Reporter "2011 - The Year in Photos" January 27, 2012. Friends of Mariner's Trail 2014 Wall Calendar, Photo for the month of February. CarolineStreet ArtBook, Fall/Winter 13/14 edition. 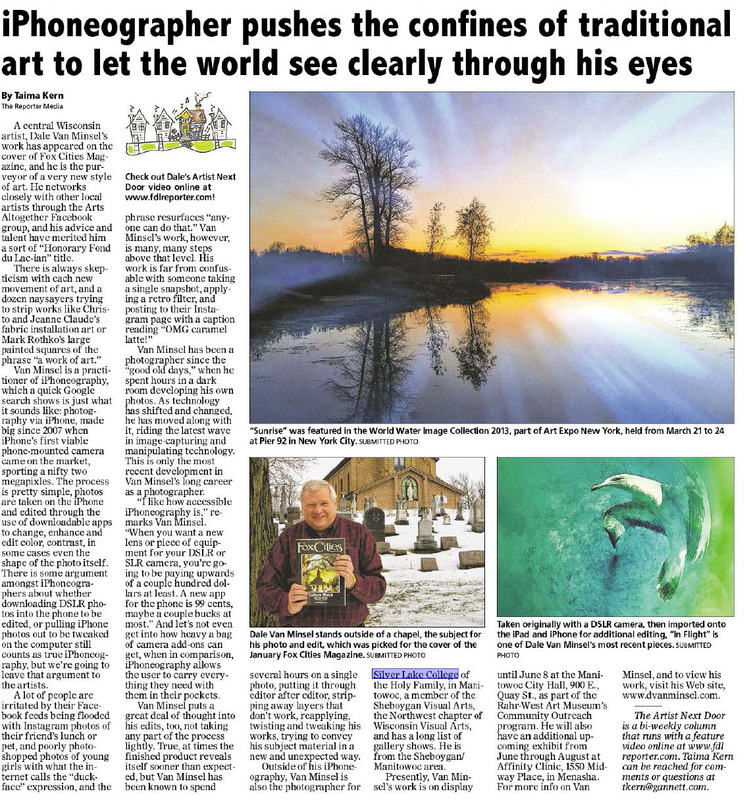 Cover and feature story in "The Current" newspaper, December 2014. My Favorite Fondy 2019 Calendar. Photo for the month of March. Portfolio and feature article in Mar/Apr/May 2019 issue of Wisconsin Visual Artists Magazine. Best of ArtSplash grand prize winner, 2014.